KUALA LUMPUR: A paperwork and presentation on the Harapan Coin which utilises cryptocurrency and blockchain technology has been prepared and will soon be presented to Bank Negara Malaysia (BNM) and Prime Minister Tun Dr Mahathir Mohamad. It was reported that the Harapan Coin, is set to be the world’s first political fundraising platform using the two technologies. Federal Territories Minister Khalid Abdul Samad said although the decision and approval from BNM and the Pakatan Harapan (PH) Presidential Council may take a while, he is however determined to continue proposing the project. “The decision on the matter is definitely not only from myself but it also involves the important parties such as the central bank and the prime minister. “I have prepared a presentation to be presented to these important parties and it may take a while to get the approval as the prime minister himself is occupied with tight schedules and this is not the main agenda as of now. “But, I want to pursue with this project...we should also set up a regulatory body to make sure that the project will not be easily manipulated by outsiders. “It is something that we will carry out, and this is something for the future,” said Khalid at the Universiti Malaya (UM) Blockchain Technology Lab and National Blockchain Seminar launching ceremony here today. Khalid, who is the co-founder of the project, said the cryptocurrency technology can also be used to do payment transaction of licenses, payment of summonses and many more, to the government bodies or sectors. He also said the demand and currency for cryptocurrency will go up if there was a market and demand for it. Khalid, who is also the AMANAH communications chief, said he may propose the technology to be used in the party’s election which is reported to be held next year. “When we use this technology, people will no longer have to fear of trying something that is new to the country (market). They will see that this technology is transparent and has accountability. “At first they will have doubts and fear towards this technology as it is new to them. But, it is not impossible to carry this out in the future. “But, what we can see at the moment, most of the private sectors are using this technology as it is not a big risk to take on for their businesses. In most cases, the private sectors are the ones who will be spearheading the changes in technology,” he said. 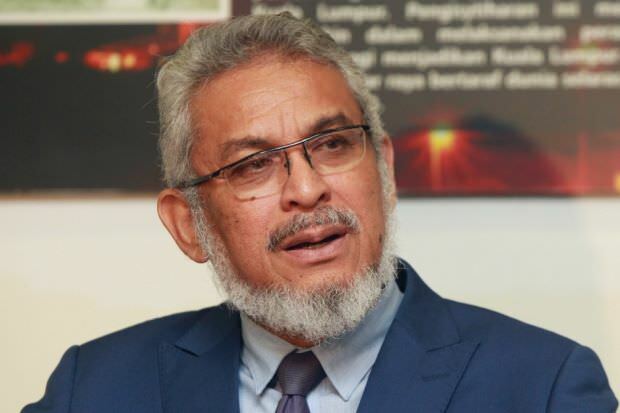 Meanwhile, on the recent flooding issue in the capital city, Khalid said his ministry will continue to have a discussion with the Kuala Lumpur City Hall (DBKL) and development project contractors to solve the flooding issue. He said his ministry has sought DBKL's help to carry out checks and identify which development projects that causes major flooding in the city. “We have ask the city hall to do checks and identify areas that are prone to floodings. They will consult the project contractors to solve the flooding issue,” he added. It is going to be difficult for the older generation to understand the concept of cryptocurrency. Even the millenials are not very educated on this subject. Should this cryptocurrency be implemented nationally, there should be suitable guides to educate the users so that they understand what they are handling and what they are investing in. Cryptocurrency is a trend, we can't avoid! Very interested to know how this will turn out. Malaysia jumping on the bandwagon of cryptocurrency. It's true that it's mostly the private sector that's using blockchain technology. Good to see that the government is opting for something that they are learning from the private sector.